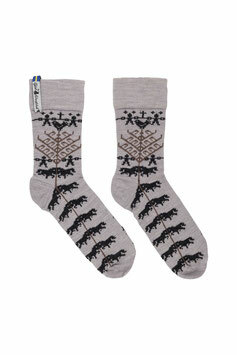 This design is inspired by the Viking era Överhogdal tapestries with the world tree (Yggdrasil) and the bird who warned about Ragnarök. We have patterned and dyed in subtle natural colours.These socks are a blend made of 80% Merino wool 15% Polyamid 5% Lycra. These socks have some stretch to them so the size ranges will overlap. These size translations are approximate but if you know your European shoe size, use that. Small is marked as "34-37"
Medium is marked as "38-41"
Large is marked as "42-45"
Some may want to size up for a wider fit in the ankle or calf. Scroll below to see larger image.